Recently, I was out with a big group of old coworkers. As most of the people were leaving, a good friend of mine wanted to stay out and keep the night going. I always have fun with this guy and I rarely get to hang out with him, but my inner-voice was reminding me how I need to get up early so that I can workout and not be hungover so that I can be productive for my business. I was really bummed that I had to call the night early. I’m one that doesn’t like to do this, I like to be the last man standing, if you will. As I was driving home, I was contemplating whether I should go back and continue the evening’s festivities. But I knew that if I did, I’d be without a car the following morning, I’d miss my morning workout, and get a late start on the day. None of which, in the past, have proven good for productivity. Do you agree that most people are seeking maximum happiness? That’s how it seems to me, so it struck me that life can be broken down into a happiness equation or function with many inputs or variables. In order to maximise happiness, you must maximize this equation. Is your memory of pre-calculus starting to become a bit more vivid? So if you have no money, you have no happiness. If you have some money you are starting to become more happy. 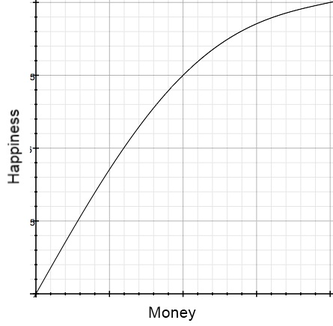 But there is a point, near the top, where the more money that you have doesn’t bring that much more happiness like it did at the bottom of the graph. It’s no longer a 2d graph. This is because there are two variables “m” (money) and “s” (socialization). Now maximizing this is a bit more difficult. You’ll notice there are several local maximums. Depending on where you perceive the origin) to be, it could be stated that if you have a lot of money and little socialization you are happy or if you have a lot of socialization and a little money you are happy or even if you have some socialization and some money, you are happy. 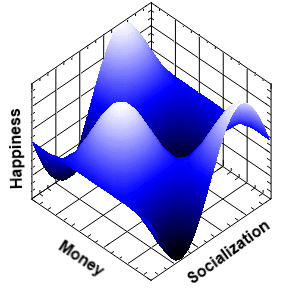 But as we know, our hypothetical happiness equation or function does not depend solely on money or socialization. 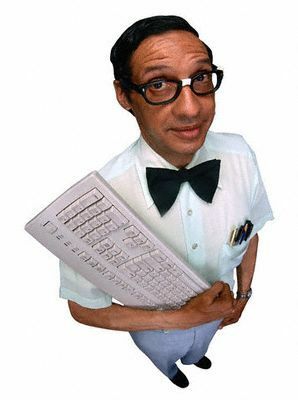 Variables could also be healthy eating, spirituality, exercise, time spent with family, time spent on hobbies, etc. You must figure out what is the right amount of each in order to bring you maximum happiness. This is part of why entrepreneurship holds so much meaning to me. Successful entrepreneurship encourages you to really think about these variables. It encourages you to consider how you spend your money and how you spend your time. Very successful entrepreneurship can even bring you a life full of more free-time so that you can try to maximize this equation even more. Which is Better: the Journey or Destination?